Flannel Friday: Count and Clip Cards! Okay, I admit it…I can’t take credit for this Not-A-Flannel Friday. I am basically just posting this to make sure that everyone in the Flannel Friday community is aware of The Measured Mom and her awesome, free printables! 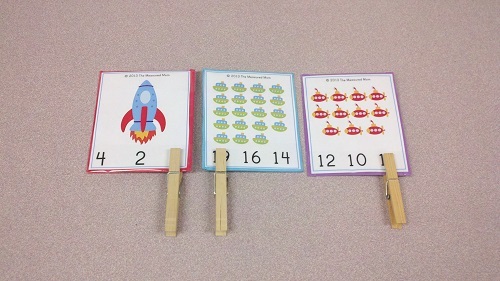 These transportation count and clip cards are perfect for a Things That Go storytime because they not only promote STEM, but they also reinforce fine motor skills! After I printed the transportation count and clip cards template, I used a combination of thin cardboard, colored paper, and book tape to make these cards both attractive (or, I should say, more attractive) and sturdy. This is a great project for teen volunteers to work on, but if you’re lacking volunteers and have some spare sheets of laminating paper, you could always just laminate the cards. To use these cards in storytime (my Things That Go storytime is next week), I’ll simply pass them out with clothes pins, then give the kiddos a few moments with their caregivers to count and clip. I’m hoping that I’ll be able to give at least two cards per child, but I only made 30 cards, so that really depends on the size of the group. If I end up having a big group, I’ll hand out one per kid, then have kids switch cards after a minute. Brooke is hosting this week’s Flannel Friday over at Reading With Red. To see past Flannel Friday entries, visit the Flannel Friday Website or the Flannel Friday Pinterest Page. Thank you so much for linking to my clip cards! I always refer to your letter posts when compiling my letter of the week book lists. I wish you were my kids’ librarian — we suffer from cranky librarians at our library :). It’s so awesome to see a librarian truly passionate about early literacy. Thanks! I hadn’t seen her site before.